Since “Tidying Up” was released on Netflix, it seems the latest lifestyle trend is throwing out everything you own. On the show, tidying expert Marie Kondo helps people clean and rearrange their homes following her KonMari method. She has her clients go through their belongings by type, get rid of things that don’t “spark joy” and re-organize those that do. Last year, I got ahead of the Kondo curve and disposed of about a third of the items in my apartment. I also made over $1,500 selling my clothes on Poshmark, an online marketplace where people can buy and sell clothing, shoes, accessories and makeup. 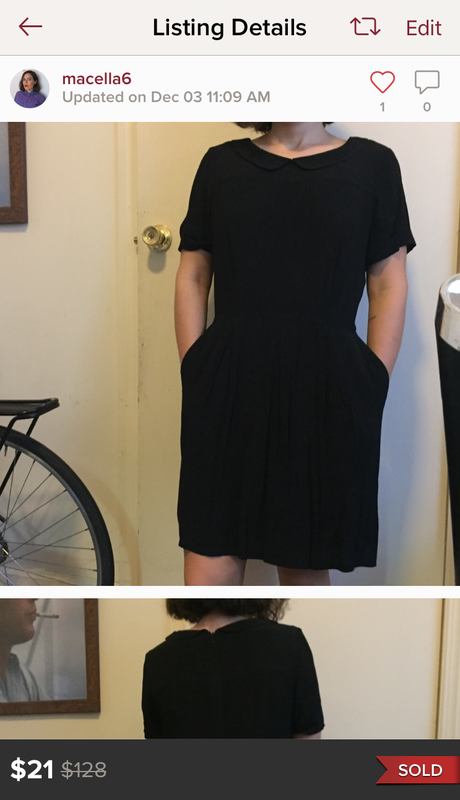 While I’m certainly no Marie Kondo, my apartment has never been tidier and nothing sparks more joy in me than selling an item of clothing I no longer wear to a stranger who lives across the country. Here’s how to clean out your closet and make some cash using Poshmark. If you want to get rid of items, you have to go through them first! Kondo has her clients empty their drawers and closets, then pile every single item of clothing they own onto their bed so they can see it all at once. This is an alarming process — even if you don’t think you have a lot of clothes, you’ll be shocked when you see how big your pile is. Fold the clothing you decide to keep Kondo-style (it honestly is the best way to store clothes), then start going through the items you want to get rid of. Check for signs of heavy wear: stains, holes, pilling, etc. Some worn down items may still be usable, so put them in a bag to donate to Goodwill, The Salvation Army or a local charity of your choosing. I bring my most destroyed or stained clothing to my neighborhood farmer’s market which does textile recycling. Slight signs of wear don’t necessarily mean something is unsellable — especially if you sell your clothes online instead of at a thrift store like Buffalo Exchange, Beacon’s Closet or Crossroads. Another bonus of selling online is that there’s no impossibly cool, stone-faced salesperson who will sort through your clothes as you watch and make you feel like the most unstylish person on earth when she offers you $5 for one item and trashes the the other 40 items in your pile. Pictures are the most important part of the Poshmark process. The app makes it easy to take and upload photos, and allows you to post up to eight per listing. Modeling your clothes will definitely help you sell them, but you can pull photos from retailer websites. I normally also hang sweaters and tops on a wall to photograph them to give people a good idea of what the items look like. Be sure to photograph and describe any flaws, even minor things like a little pilling under the arm of a sweater. If you manage to sell something without noting flaws, the buyer could lodge a complaint and end up returning it for a full refund. You’ll likely have to sell flawed items at a big discount, but it’s still worth it. I once sold a pair of overalls with a hole in the crotch and the buyer gave me a 5-star rating. I originally bought them for $150 (don’t judge me! ), listed them for $25 and ended up selling them for $20, so once Poshmark took its 20% cut, I made $16. That may not sound like much, but every bit adds up. And from the buyer’s point of view it’s a great deal: she spent $20 on the overalls which were in otherwise great shape, and even if she paid an additional $20 to have the hole repaired, she still saved over $100. Poshmark is part marketplace, part social media app, so selling does require some effort. I recommend sharing everything in your closet once or twice a day in order to build a following and make sure people are seeing your stuff. You’ll also notice that there are several “parties” each day — these are important. There are “parties” for different brands, luxury items, kids clothes and all sorts of other things. One regular party, for example, is called “Everything Petite.” If you have any petite items in your closet, you should share them during this weekly party to attract buyers who may be browsing it. 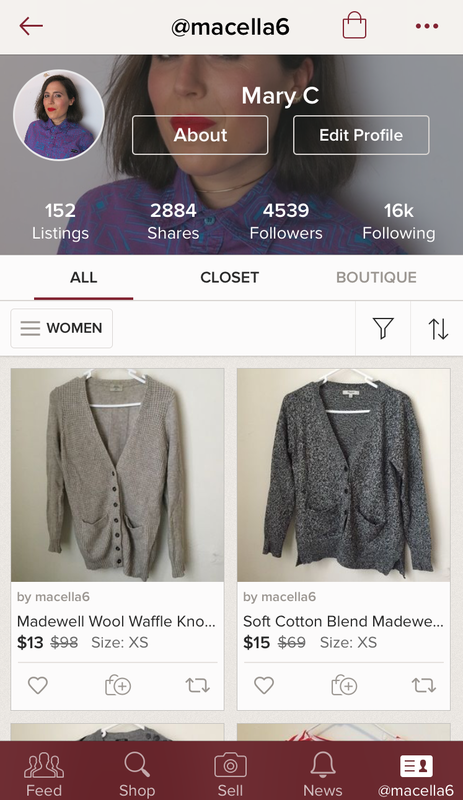 If you’re looking to sell quickly, share on Poshmark at least once a day — and see if you get any comments or likes! Make sure to price things a few dollars higher than you expect to sell them for so you can offer a discount. Once you list an item on Poshmark, you’ll (hopefully) start getting likes. If you get a notification that somebody has liked something in your closet, click on that item, then on the button at the bottom that says “Price Drop.” From there you can offer anybody who’s liked your item discounted shipping and a 20% or more discount on the listing price. To entice people to buy several items at once, you can offer a bundle discount. Buyers can bundle several items together and purchase them all at once so they save money on shipping. Mine is set at the highest discount, so if somebody buys two or more items from my closet, they automatically get 30% off. If you’re more interested in cleaning than making money, it’s a great way to get rid of things quickly. Another trick that’s worked for me is looking up similar items to ones I’m selling and following everybody who has liked that item. It gets their attention, and your item may be in better condition or listed for a lower price, which will really get their attention. One of the best things about Poshmark is that the buyer pays for shipping. You get an email with a pre-paid shipping label as soon as you sell an item, making it easy to drop your package in the mail without having to deal with the post office. Just make sure your items are clean, unwrinkled and nicely packaged before you ship them off. Think of selling your clothes as starting a small business. That means you have to spend a bit of money to make more money, but even the smallest investment helps. For example, I spent $15 on 100 cute mail bags that have garnered great feedback and will last a while. Back when I had a steady income, I was a bit of a shopaholic. I proceeded to hold onto nice things from my office job days that I knew I would never wear but felt guilty giving away because money is tight. Selling a piece for even $10 alleviates my guilt, and since I started using Poshmark about eight months ago I’ve sold 114 items and made $1,522. 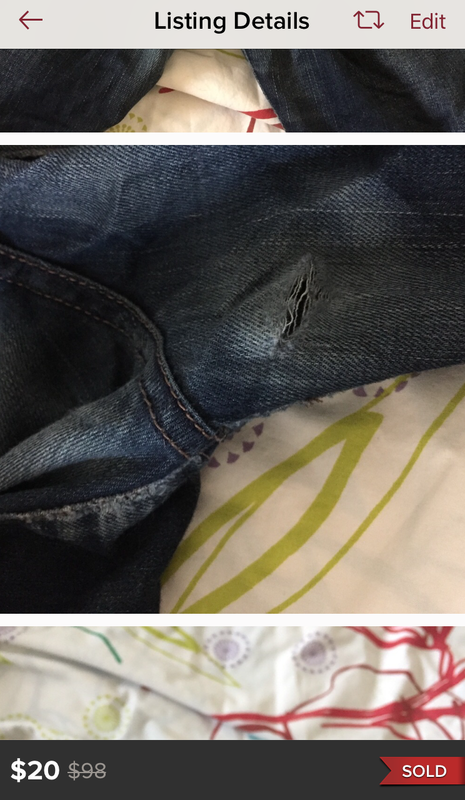 Poshmark has taught me the value of worn clothing, which is different from the value of new clothing. While it may seem reasonable to spend $100 on a sweater, realizing how much its value will decrease after a season of wear will make you think long and hard about whether or not you really want to buy it. We’ve all heard the saying quality over quantity, but going through this process helped me to understand it. Selling my stuff has taught me that good clothing is worth investing in and inexpensive clothing is cheap for a reason. More than that, it made me realize how little clothing I actually need. I’ve taken some of the money I made selling on Poshmark and invested it in a few well-made items that I know will last for years and that truly spark joy in me. My closet has never been cleaner, and I’ve never been happier with it! Do you have any tricks of the online clothing trade? Let us know on Facebook, Twitter, or Instagram. See more at Nooklyn Stories!